Above is an update of a design that was originally on my other blog (which you can see here). Long story short: the original design was offered but we had to withdraw it due to legal reasons. Essentially we can’t do anything owned by NBC Universal (and that includes Jurassic Park, Stargate, and Last Starfighter), at least not in an unofficial capacity. The updated design features a Vipers front logo (I made it pluralized), and logos on the arms to mimic the wings of the Mark II (the ship on which this whole design is based). I also moved the Primus patch to make room for a Captain’s ‘C’. Obviously there are no plans to make this available anytime soon, sorry! 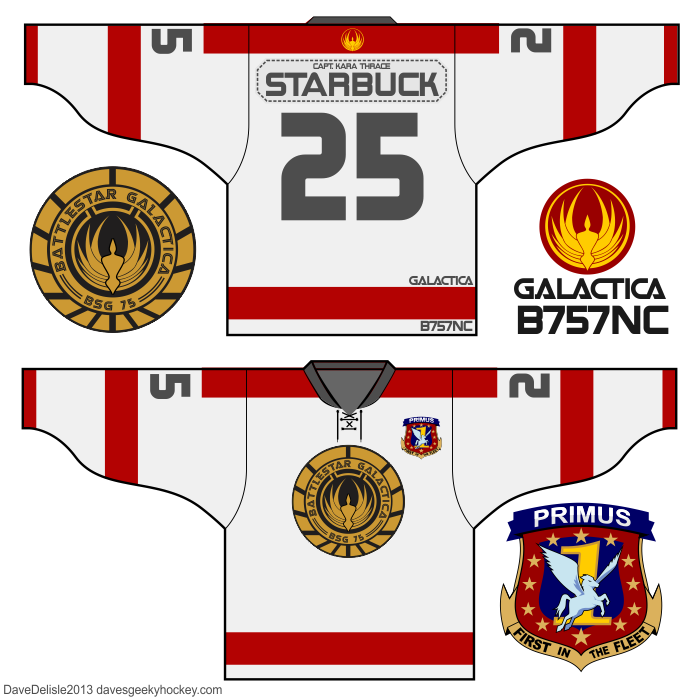 Posted on August 5, 2013, in Geeky Hockey Jerseys Available, Hockey Jersey Design and tagged Battlestar Galactica, BSG, Geeky Hockey Jerseys, Hockey Jersey Design. Bookmark the permalink. 10 Comments. Oh this is so full of win. Want. I am drunk with power! Mwa-hahahaha-ha! Dave, I am friends with Catherine Mary Stewart https://www.facebook.com/catherinemarystewart?ref=br_tf she played Maggie on The Last Starfighter originally born in Edmonton, If you ever make that jersey I would love to get one for her. Guitar Anthony. I’m with ya with that suggestion. I asked Dave about the BOTP about 6 months ago. Unfortunately he was unfamiliar with that show 😦 So Dave again I’m pleading for a design as well.